Two new stainless seacocks above the waterline (no electrolysis with the bronze below the waterline) and one new bronze seacock and thru-hull. 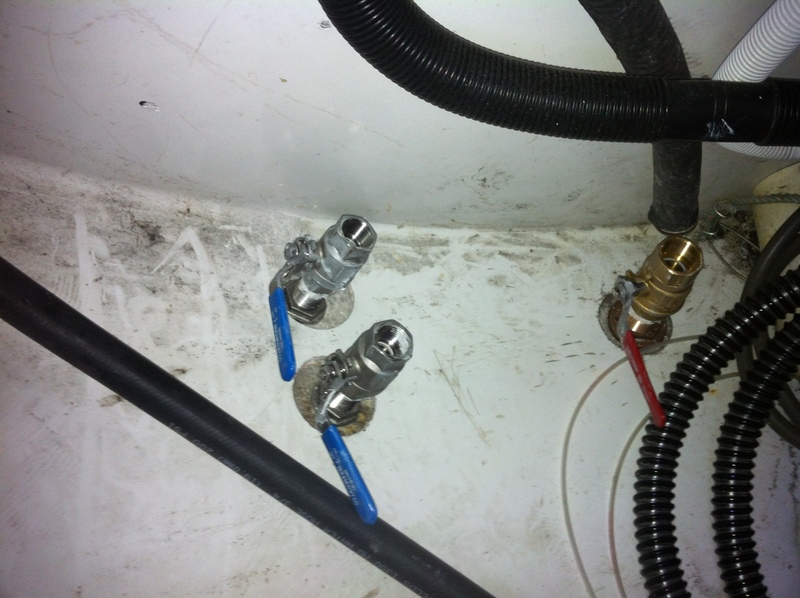 Our bilge pumps now pump out above the waterline, the way they should have been set up all along. There will be a manual pump plumbed into the bronze thru-hull and we can decide whether we want the valve open or shut as we like. Six days until we get her on the truck! This entry was posted in Uncategorized by Elan. Bookmark the permalink. My bilge pump discharges below the waterline and I am always concerned about it siphoning water when I’m underway, so I installed an inline seacock and keep it closed when I’m underway. I plan to do the same thing you’re doing. What kind of manual pump are you going with? James, the manual pump is a whale gusher. I had a Bosworth guzzler, but I really like the clamp ring seal on the whale. It’s a much quicker rebuild. Probably both pumps are about the same quality. I am excited to get the main electric pump discharge above the waterline. If I were in your position (and I used to be), I would make sure your vented anti siphon loop is in good shape. I had our bilge pump back siphon when my bilge pump motor started to die. All that saved the boat was a knife in the line. I was lucky to be sleeping on the boat that night. A vented loop is a cheap safety, but no substitute for relocating your electric discharges a foot higher. I left the below waterline discharge on the manual pump, but I plan to leave it closed unless I need it. Overall this weekend has been good to the boat/home. Pretty quick she will be all me and Ash have to keep us safe.